Discussion in 'Arcade and Supergun' started by beharius, Apr 16, 2019. 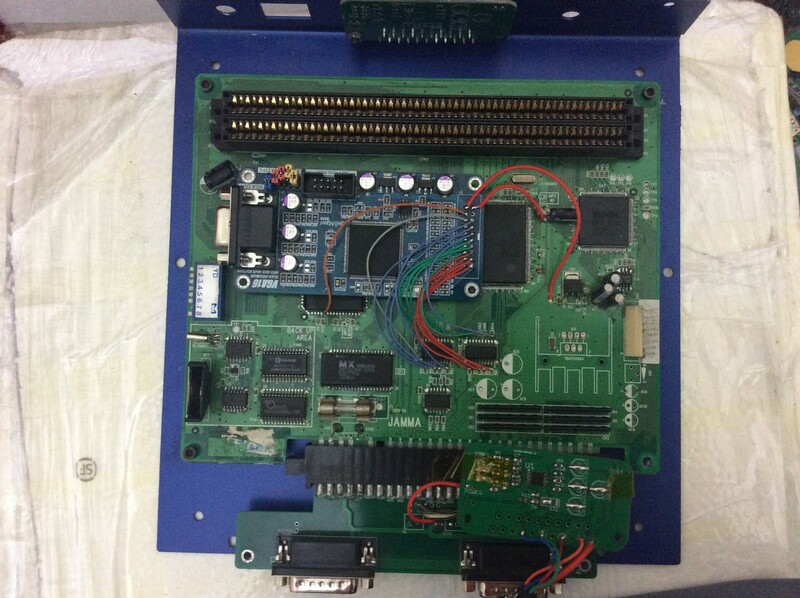 We are releasing an FPGA based line-doubler for the Neo Geo MVS arcade boards which is installed internally. It's outputting a progressive VGA signal (640X480) by tapping the digital video signals from the board. There is no loss in video quality and no lags since a frame buffer is not used. Its FPGA line doubles the signal on the fly (264 lines to 528) then handled by a DAC similar to the original Neo Geo design which converts it to analog video. Hence it's refresh rate frequency is off spec(59.1856Hz) instead of the required 59.94Hz for the 640x480 video timing format, more tolerant VGA output was preferred instead of the strict HDMI standard for compatibility issues. The installation is very simple unlike the other internal digital video mods out there. There are only 20 wires to be soldered. It uses 5 bits per each RGB colors(5x3), a sync signal, a CLK signal taken from the 68000 CPU(or mainboard), 2 grounds and a 5V. So 20 wires in total. These are all next to the 74ls273 latches, on the resistors. This mod also offers Scanlines and Pixel Blending features. These can be set by the jumpers on the board or a dip-switch to be installed on the enclosure. You can set its density by setting jumpers as 00 none,01 low,10 medium, 11 high. Pixel blending give a nice CRT experience for the user. 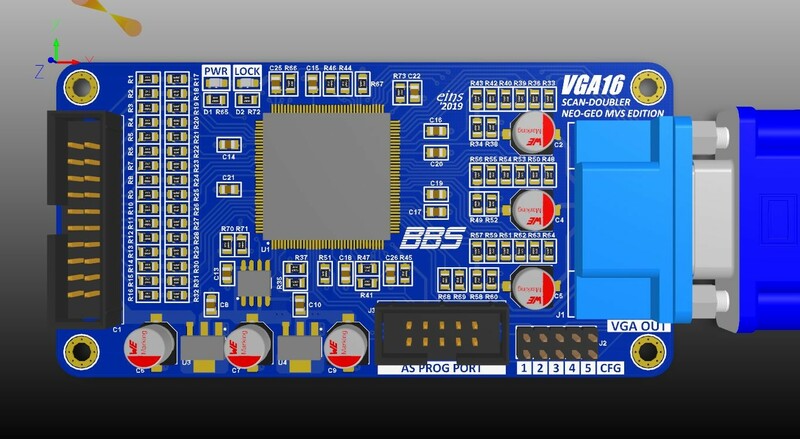 This project will be offered as a DIY kit including all the wires, please note that final boards will have an 20pin IDC socket, so only wires for the MVS mainboard need to be soldered. We will also release a limited edition, premium Consolized MVS to commemorate our 7th anniversary. This will feature a car painted high quality metal enclosure including VGA(480p) and Scart(480i) outputs. An original, upgradable UniBios. Each bios can be individualized for your needs(name, serial etc.) too. Price will be $100 including shipping. Pre-ordering TBA soon. One question it's seems MVS is not a 240p but 241 or 242 line so x2 482 or 484p. What's the output? 480p? It's a bit different actually. We call 480p because it's number of pixels that are visible. However after the scanning, there are still unvisible lines (which can carry info) until raytracing, so for the 640x480 format, 800x525 pixels are send. When we doubled those 264 lines, there becomes 528 lines, 3 lines more which is acceptable.